Household mold isn’t just unsightly; it can also put you and your family at serious risk for health issues, especially if anyone has a preexisting respiratory condition like asthma. Unfortunately, household mold is a fairly common occurrence. By being mindful of common sources of mold, however, you can prevent it from growing and keep your family safe and healthy. The most common cause of household mold is flooding. When you experience a leak from a door or window during heavy rain, mold is likely not far behind. Make sure to rectify the situation immediately by weatherproofing your home so that it’s watertight, and drying the affected area as quickly as possible. 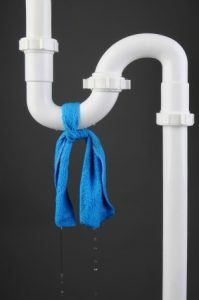 Another common cause of household mold is plumbing issues. If you notice a problem with your water pressure, or suspect that a pipe might be leaking into your wall due to water stains on your walls and ceilings, have it inspected and repaired immediately. Small plumbing leaks behind walls can go unnoticed for long periods of time, leaving opportunities for mold to grow. Moisture from the attic or foundation can also contribute to mold growth. Your home’s foundation is porous, and if rainwater isn’t properly directed away from your home, moisture can sneak in and settle into the foundation. If you notice moisture on your walls in the basement, or experience an odd musty smell, have your home inspected immediately. Attic leaks are another common source of mold. These leaks can not only compromise the structure of your roof, but also turn your attic into a breeding ground for mold spores. If you spot any signs of mold in your home, it’s important to have it taken care of immediately, so as to not risk the health and safety of you and your family members. If you’re concerned about mold growth in your home, get a free mold remediation estimate here, or give us a call today for more information.